We don’t look one bit alike, but we are family. That happens to be the story of a rather obscure group of bryophytes and exemplifies how drastically molecular technology is changing how bryophyte taxonomists study and classify this fascinating group of plants. Whenever I visit dimly lit gullies in wet forest I always try to look out for bryophytes, one of which is a rather nondescript moss that used to be known as Echinodium hispidum. It was the only one of it’s genus in Tasmania and the nearby New Zealand has another species, E. umbrosum. A very limpid way of describing this moss without getting into a tirade of alien sounding botanical terms would be to say that it is branched, has spirally arranged leaves that are widened toward the base. A look under the microscope will reveal the nature of the leaves. Strangely, it is probably the combination of it being rather nondescript and it’s preference for dimly-lit gullies that enables almost instantly recognition of the species for the trained eye. The genus Echinodium was erected in 1866 and was honored a family status of it’s own, the Echinodiaceae in 1909. Within bryological circles however, the family and genus is of some interest because of it’s anomalous distribution of it’s members: out of 6 species, two are found in Australasia (Australia and New Zealand) and four in Macronesia. Earlier in 1986, taxonomist Steven Churchill was starting to sense that something was quite amiss with the species of Echinodium. He included all 6 species under Echinodium but was prudent enough to suggest the genus could potentially contain species that are not related to each other. However, observant as Churchill was with the light microscope, the ‘molecular microscope’ was about to throw a spanner into the works. In a recent study in 2008, Michael Stech and colleges, compared the specific DNA sequences of the six Echinodium species with species of other moss genera and found robust evidence that the six species of Echinodium did not form cohesive group. The Macronesian species largely remained in the Echinodiaceae but the two Australasian species were actually found to be more closely related with a totally different genus of mosses, Thamnobryum, a member of a totally different moss family, the Neckeraceae. With such definitive prove of the new generic relationships, Stech and colleges renamed Echinodium hispidum to Thamnobryum hispidum. 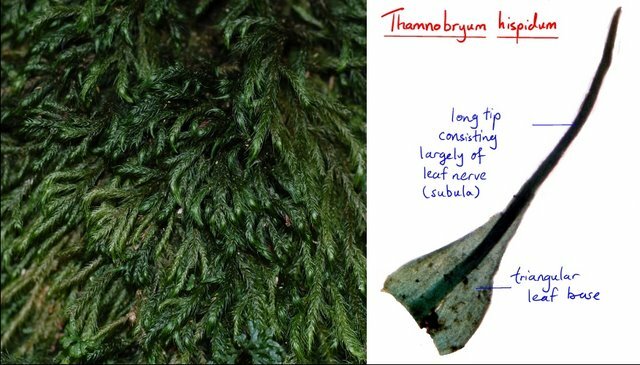 Now, while mosses are simply mosses to some, anyone who would take even just a cursory look at the now T. hispidum and compare it to other species of Thamnobryum will find it hard to reconcile this new relationship. 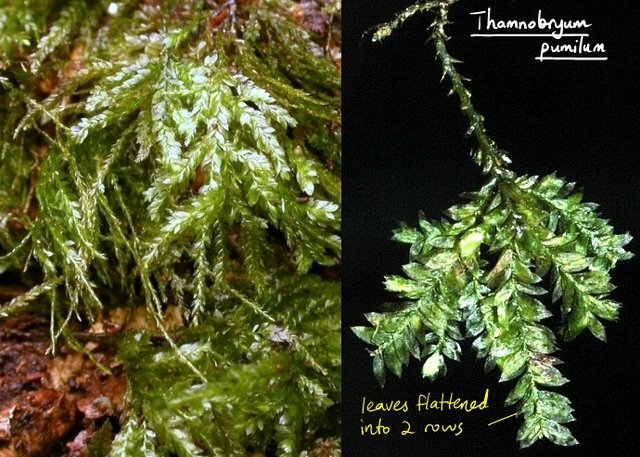 For instance, the commoner Thamnobryum species in Tasmania, T. pumilum, is somewhat dendroid (shaped-like a tree); the leaves are flattened in a single plane; and the plants tends to produce thin wiry branches in addition to normal ones. No familial resemblance whatsoever between the two species. Molecular-based taxonomies of bryophytes have lagged behind that of vascular plants but whatever little that has been done is already revealing some rather surprising and revolutionary information that is eroding the very foundations of established taxonomies of the 20th century. There is always more than meets the microscope when it comes to studying bryophytes! This entry was posted in Botany, Bryophytes, Key Characters, Molecular Evolution, Plant Morphology and tagged Echinodiaceae, Echinodium hispidum, Neckeraceae, Thamnobryum hispidum, Thamnobryum pumilum. Bookmark the permalink.